Serving Southern Maryland and Washington DC with Maryland Crabs! 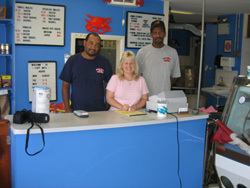 Captain Mo's Seafood Carryout has been the premier location since 2004 for anyone in Washington DC, Prince Georges County, Charles County or Anne Arundel County, Maryland or the Southern Maryland areas for finding fresh Maryland steamed crab and spiced shrimp, snow crab legs, fish and oyster seafood carryout. It is family owned and operated located in the heart of Southern Maryland just south of Waldorf in White Plains. Captain Mo's is convenient not only to Charles but St Mary's and Calvert County. The owner brings 15 years of crab and seafood industry experience to this business with careful attention to detail day in and day out of how the seafood is prepared. Come in to see us soon! This Chesapeake crustacean is probably the most enduring symbol of Maryland. Mature, blue crabs average five to seven inches across, and are most plentiful from late spring through the fall, although crabmeat is available fresh or pasteurized year-round. Ask about our 3 dozen Special. Medium, Large and Jumbo Males available by the dozen only. The next time you want succulent Maryland Steamed Crabs, shrimp, or seafood, head to Southern MD or call in your order to Captain Mo’s Seafood! All Crabs are cooked in J.O. Spice. 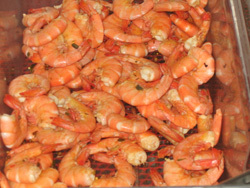 All Shrimp are Steamed and Spiced or Extra Spice Upon request. 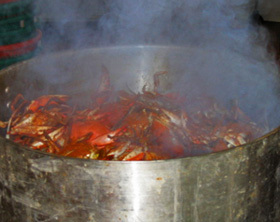 Mixes are available for Maryland Style Crab Soup and Cream of Crab Soup. If you purchase live shellfish, (i.e. lobsters, crabs, oysters, clams, and mussels), discard any that die during storage. To cook, measure fish at its thickest part. Figure 10 minutes of cooking time per inch of thickness. Maryland Seafood... It's as good as it Looks! 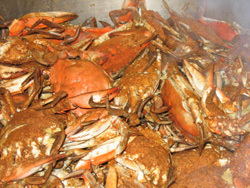 Captain Mo’s Seafood is the premier Maryland, DC, and PG steamed crab and seafood destination in Waldorf and Southern MD. Come to Captain Mo's for the finest steamed Maryland crab seafood market and carryout, spiced, jumbo shrimp, snow crab legs, fish and oysters. Captain Mo's serves customers from these areas: White Plains, Waldorf, La Plata, Hughesville, Bryans Road, Bryantown, Hughesville, Indian Head, Saint Charles Fort Meade, Upper Marlboro, Brandywine, Fort Washington, Greenbelt, Beltsville, Clinton, College Park, Laurel, Hyattsville, Landover, Bowie, Glenn Dale, Mitchellville, Cheverly or Crofton Indian Head, Upper Marlboro, Annapolis, Arnold, Severn, Severna Park, Edgewater, Davidsonville, Crofton, Pasadena, Crownsville, Millersville, Linthicum, Jessup, Lothian, Glen Burnie, Washington DC, Prince Georges County and Charles County Maryland and Anne Arundel County.